You are here: HomenextBrowse ArticlesnextBuildings and DevelopmentnextShops and BusinessesnextRonald Baker's Yard, Benfleet Creek. Circa 1955, Ronald Leslie Baker started a boatyard on the north shore of Benfleet Creek, approximately adjacent to the level railway crossing, before relocating, on construction of new road/bridge, to another boatyard: Marsh Road, (now Wat Tyler Park) Pitsea, Essex. The boat in my photo, shows an ex-Royal Navy Motor Torpedo Boat, (MTB). I am told this boat was used as a house-boat that I lived on with my mother Jean Baker, nee Dart, with my elder, baby brother, Derek for a very few years, probably up to the building of the new road and bridge and the relocation of my father’s yard. This MTB was one of many similar vessels, lighthouse ships, barges, etc. that my father acquired from mainly naval stocks, run down after the 2nd World War. 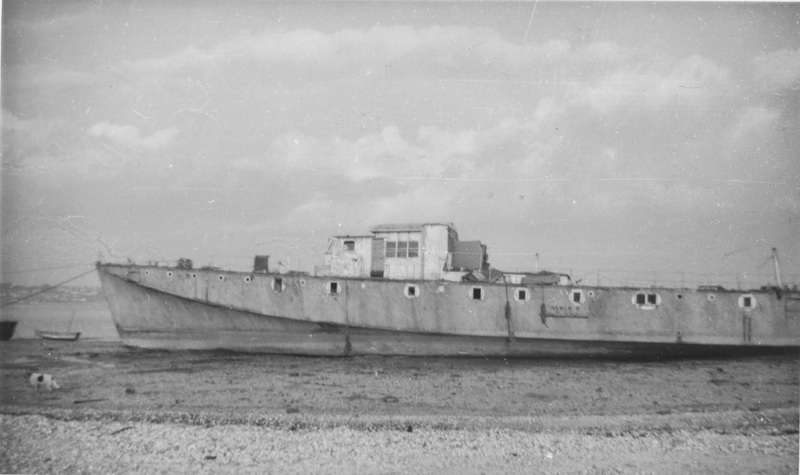 These boats would be re-sold or broken up for salvage or burnt, usually at Canvey Point, for their scrap value. This work was also undertaken by Eric Baker, the elder of the three brothers. There is another photo, linked to my father, on the page, ‘Recording the changing face of Benfleet : Part Two’, of another of his MTBs being towed, by his brother Dennis. I am sorry to have to mention that my father was murdered, at home at Church Road, Benfleet, in his later years. I would be very interested to see any photos of my father or of his yard(s) if anyone has any please? I have no memories of this era, as I was then a baby living on the MTB before living in Leigh on Sea and then, later, back to Benfleet.